Posted by gordonwatts in D0, Fermilab, Higgs, physics. Yesterday I mentioned that the Tevatron experiments had finally started to rule out the Higgs. I thought I’d post another plot that shows exactly how hard it will be – and so gives you an idea of how much hope the Tevatron has of actually catching the Higgs. Click on the plot to get an enlarged version of the jpeg (here for details). The most important lines in that plot are the black one (1-CLs Observed) and and the 95% CL thick blue line. The thick blue line is the point at which, in our best statistical estimate, we are 95% confident that we have not observed anything. While the blue line is the “goal”, the black line is where we are now – the current observation. A lot goes into that black line – many different physics analysis contribute (from both D0 and CDF), the physics of the Higgs decay, the physics of how the Higgs boson is supposedly made, and how good our detector is at seeing the Higgs. As you can see, we have just peaked above the 95% level near 170. And that is what allows us to say that we’ve excluded the Higgs around 170 GeV. Now, the future. You’ll note that the curve is pretty flat near where it peaks above 170. That says to me that when we add more data and minor analysis improvements we will be able to quickly broaden the amount of the observed line is above the 95% CL line. Where the black line is steeply falling, however, it require a huge amount of work (even if it is possible at the Tevatron). Finally, in yesterday’s post the plot started at 114 GeV. This one starts at 155. What about everything from 114 to 155? Yes — we are working on that. For example, at D0 we have individual results already (and if you look at this plot, given the discussion, you can see that how we are doing as far as getting towards ruling things out at low mass – though the plot is a very different type of plot – but you can guess what is going on if you are not familiar with it). I couldn’t find the recent update of the CDF combined results. But the low mass combination between the experiments was not completed in time for ICHEP. I’m hopeful that we will see it soon – but as they say, it ain’t out until it is ready to be out! Posted by gordonwatts in D0, Higgs, physics. See that little red blob around 170? That is the Tevatron starting to seriously tackle the final big physics problem left on its plate. Where is the Higgs? The question is — will it finish the job before the LHC starts producing real physics? The numbers on that plot are the mass of Higgs boson, the final bit of the Standard Model we physicists haven’t directly observed. The last experiment to search for the Higgs were the LEP experiments. As you can see, they searched up to 114 GeV. The Tevatron is searching from 114 up as high as it can go — it so happens the first bit it was able to exclude was around 170 GeV in mass. The Higgs mechanism is what gives most particles mass. If it was absent from our theory then many masses (and other things) we have already measured would be wrong. That does not mean, by the way, that the Higgs has to exist – but something like it does have to exist. The Standard Model Higgs is just the simplest explanation that we came up with fix the masses. If that whole range is searched and nothing is found – that would be huge news. And very puzzling! Press Release Here. And combined CDF and D0 note describing the analysis here. Posted by gordonwatts in Higgs, physics life. Ok, this wasn’t April 1st, rather April 4th. What is worse is CMS saw him first. Darn! 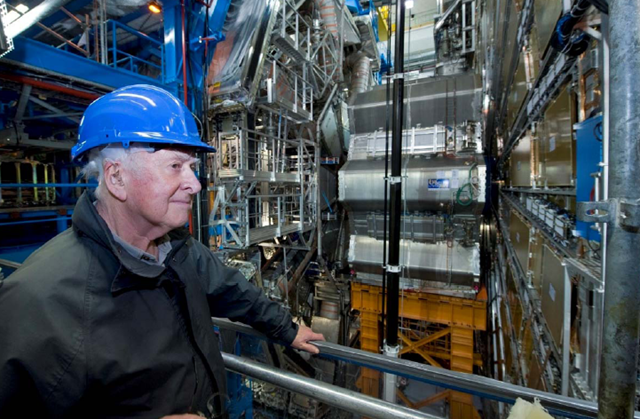 That picture is of the ATLAS detector and Peter Higgs, the fellow whose last name is attached to the Higgs particle – the particle that all of us are after. Coincidentally an email conversation broke out on a D0 mailing list around the time of this picture discussing the origins of the Higgs mechanism. It was sparked by this yahoo news article. The title is “‘God particle’ expected to be found soon.” Hmmm. Expected to be found? Not sure we are that sure… At any rate. The email conversation was interesting because because it pointed out that in science often more than one person has the same idea at the same time. Discovery is partly having all the bits in place to build the discovery on. Once all the bits are in place then several people can make the leap. I’m not familiar with this bit of history, besides Peter Higgs, there was also Robert Brout, Francois Englert, and Tom Kibble in Europe. There are two in America too – Gerald Guralnik and C.R. Hagen. I note that on the Englert page what we normally call the Higgs mechanism is called the Brout-Englert-Higgs mechanism. On the Kibble page it notes that he is credited with the co-discovery of the Higgs with Guralnik and Hagen, the beauty of wikipedia! 🙂 [they are all basically right, I believe]. Oh — hey — and the UR home page has something up about Hagen as well. I went to the University of Rochester for my graduate work and my quantum mechanics class was taught by Hagen. At the time I didn’t fully appreciate the work he had done. Posted by gordonwatts in Higgs, physics. Yesterday, at the Moriond QCD conference, Uli Heintz gave the Tevatron Top Mass talk (pdf). New mass results have made the Higgs a little less mysterious. Summer results had a measured top mass of 171.3+-1.7 GeV and now it is 172.8 +- 1.4 GeV. This is good news for the Standard Model. One of the beauties of the Standard Model is that it holds together so well as a theory. It predicts many different experimental measurements. And all those measurements must be in line with each other — the model cannot accommodate a measurement that is out of whack. And the better we make these measurements the better we can tell when one is out of whack. The Higgs mass is no different. Even though we’ve not seen it yet, the Standard Model predicts its mass. With the new top mass result, the predicted mass is 87 +36-27 GeV. Using last summer’s top mass the predicted Higgs mass was 76 +33-24 GeV. Note the very large errors on those numbers – there is a lot of slop in that measurement! This is good for the Standard Model because of work done at the LEP collider. They searched for the Higgs and didn’t see it – they know that the Higgs mass is more than 114 GeV. The summer’s prediction put the Standard Model more out of whack than the current one – the new predicted value of the top mass is more in line with the LEP Higgs search. Still – I’d love to know where that thing is hiding (along with everyone else)! The latest Higgs results should have been released – but I’ve not seen them publicly posted yet. N.B. That plot is the summer plot — I couldn’t find the plot with the most recent results – I found it only in Uli’s talk.